One of the things I love about Indonesia is the food, in fact it is my my favourite Asian food and a bit of a guilty pleasure. Living in Holland it was always easy to satisfy my craving for it and often when I go home to Holland now, you'll find me sneaking in a little Indonesian take-away. Not so much here in London as Indonesian food is hard to find. So when I went to Indonesia I was really looking forward to pigging out. Most touristy places In Indonesia will serve the standard fare such as nasi goreng, sate and gado gado. 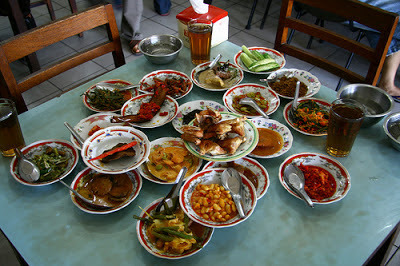 But if you want to savour Indonesian food that's a bit more adventurous, I'd suggest to try the food from Padang in Sumatra. Padang food originates from the people of Minangkabau in Sumatra, but you don't have to go to Sumatra to eat it. It's available throughout Indonesia and I tried it in the Kuta and Seminyak area in Bali. The principle is very simple. The different dishes are all displayed in the window of the restaurant in stacked up bowls. The warm dishes are kept warm on burners. You start with a plate of rice and you simply point out to the person at the till what you want. The food is halal since the people of Minangkabau are muslim. So typically you can choose between meats like chicken, beef and goat. 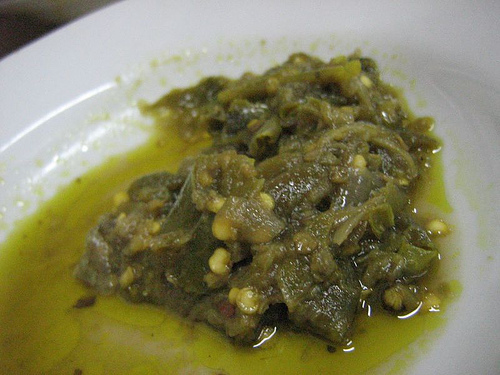 There are loads of veggie dishes as well such as eggplant, beans and cassava leaves. There are eggs and tempeh (soy burger is the best way to describe this) and of course krupuk, prawn crackers. I was eating mostly on my own, but padang food is for sharing. Pretty much like the Spanish tapas. Bowls with the different dishes are put out on the table and everyone helps themselves. And the best thing is, you only pay what you eat. No wasted food, but alas, also no doggie bags! Just one tip: Do have a jug of water at the ready. Padang food is spicy as hell. Don't say I didn't warn you! Now all I need is a Padang-Padang shop right here in London. This looks tasty - there nearest we have got is street food in Singapore where we just pointed as we couldn't read the menu! Tasty tasty! That makes it all part of the adventure. Lol. There are some lesser fiery dishes as well. But do try. lol. Yeah don't eat foodie posts when hungry!